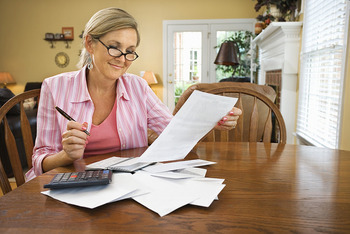 Where to find the funds and how to settle on the terms for providing in-home care. If you're one of more than 70 million people who provide unpaid caregiving for a family member or friend -- either in that person's home or in your own -- you know that the time and energy burden can be enormous. In fact, you may have cut back or given up your paying job. Your smaller (or now nonexistent) paycheck may be pinching you hard. If so, it might be possible for you to get a small but regular payment for your caregiving work. Here's how: If the parent, spouse, or other person you're caring for is eligible for Medicaid, its Self-Directed Services program (also known as Cash and Counseling), available in some states, can provide direct payments that could go to you. A few other states have similar programs for low-income seniors, even if the person receiving care doesn't quite qualify for Medicaid. Also, if the person you're caring for has long-term care insurance that includes in-home care coverage, in some cases those benefits can be used to pay you. If the person you're caring for will be paying you from any source, it may be a good idea -- for both of you -- to draft a short written contract setting out the terms of your work and payment. People with low income and few assets other than their home may be eligible for Medicaid (called Medi-Cal in California) healthcare coverage. This includes in-home care, which can mean some low-level healthcare monitoring and services but which usually consists mostly of personal care -- the same kind of care you probably provide: help with bathing, dressing, cooking, cleaning, eating, moving around, and similar activities of daily living. When Medicaid provides in-home care, it usually does so through a licensed home health care agency. Medicaid pays the agency, which sends its care aides to the senior's home on scheduled visits. This arrangement works well for many people. But for others, in-home care through an agency isn't the best arrangement. Many in-home care agencies are overstretched, with high worker turnover. This can mean that in-home care visits are sometimes irregular, with changing caregivers who don't know the senior's needs and preferences. And if you (or another family member) are already providing most of the care, the occasional presence of an outsider may not be that helpful. Experts in in-home care understand that family members often make the best caregivers. Knowing this, and recognizing that professional home care agencies aren't always able to provide consistent care, Medicaid in some states runs a program called Self Directed Services, which pays seniors directly to cover their in-home care. The amount the senior receives depends on a Medicaid assessment of need and the prevailing pay rate for in-home care aides in that state. Seniors can then use the money to pay anyone of their choosing -- including you or other family members -- to provide care. They can also use some of the money to buy things for the home that would make life more comfortable, such as kitchen items, a new vacuum cleaner, safety equipment, or the like. Or they can use some of the money to pay for services such as cleaning, meal delivery, or transportation. Self Directed Services programs are currently in effect in the following states: Alabama, Arkansas, Florida, Illinois, Iowa, Kentucky, Michigan, Minnesota, New Jersey, New Mexico, Pennsylvania, Rhode Island, Vermont, Washington, and West Virginia. Other states have similar programs, offering cash for in-home care to seniors who have little money but whose income or assets are slightly too high for them to qualify for Medicaid in that state. Eligibility. If the seniors you're caring for don't already have Medicaid coverage, you can help them apply for Medicaid or another cash assistance program. This means gathering bank, tax, and other records that show how much they have in income and assets. Medicaid (or the other relevant cash assistance program) can then determine if they're financially eligible. Assessment. If the seniors you're caring for are financially eligible, the program will come to their residence to assess their in-home care needs. They'll speak with you and other caregivers about the care currently provided, and they may speak to their doctor. Determination. Based on the assessment of needs, the Self Directed Services or other program determines how many monthly hours of in-home care assistance it would approve if the care were coming from an in-home care agency. Using the rate that in-home care workers are paid in the state, it then figures out how much in total it will directly pay to the seniors every month to help with in-home care. Plan. The seniors decide who they want to provide the care and how much they'll pay you or other caregivers out of the program's monthly payment. (It has to be at least minimum wage, but it can be any reasonable amount you and they agree on.) They can also decide how else they might want to spend some of the money. The program helps seniors work out this plan, including paperwork and taxes. To find out whether your state has a consumer-directed cash assistance program for seniors, contact your local Medicaid, human services, or social services office. To find the nearest Medicaid or other state office that handles in-home care programs, contact your nearest Area Agency on Aging and ask them who to call in your state to learn about direct payment programs for in-home care. Veterans needing home-based care may be eligible for Veteran-Directed Home and Community-Based Services (VD-HCBS). This program serves veterans of any age who are at risk for institutional placement by providing home and community-based services that allow vets to continue to live independently in their own homes. Beneficiaries can choose the mix of goods and services that best meet their needs and manage their own flexible spending budgets for personal care services, which can mean hiring their own workers, including family and friends. For more information on VD-HCBS and to find program contacts in each state, visit the partner organization web site National Resource Center for Participant-Directed Services. Only a relatively small number of seniors have long-term care insurance. But if the seniors you're caring for have such a policy and it covers in-home care, there may be a way for you to be paid out of its benefits. If the policy covers in-home care but the seniors aren't yet collecting benefits, you can help them file a claim for benefits based on their care needs. If they qualify for monthly in-home care benefits and the policy pays them directly to them, they can use that money to pay you. If, on the other hand, the policy requires that payment be made only to a state-certified in-home care aide, check with the National Family Caregivers Association or the Family Caregiver Alliance to find out the requirements in your state for getting this type of certification yourself. Often, low-cost certification classes are offered at local adult schools or community colleges. If none of the direct pay options apply to you, investigate whether you're eligible to claim your parent or other qualifying relative as a dependent on your income tax return. Your relative does not have to live in your residence, but in order to qualify, you must cover more than 50 percent of their basic living expenses, including housing, food, medical services, and clothing. Several requirements must be met. For example, your relative’s earned income must be less than $3,900 (2013 tax year). Non-taxable income such as Social Security does not count toward this limit. For more information and to see if you qualify, check with your tax professional or view IRS information on the subject. If the person or people you're caring for are going to pay you (from any source, including independent funds) for caregiving, it's a good idea to draw up a simple contract that sets out the terms of the care and payment. This can help avoid uncertainty and disagreement about what you're supposed to be doing and when. Also, it can help avoid misunderstandings with other family members about who's supposed to be providing care and where the money is going. If the person or people you're caring for ever need to enter a nursing home and aren't already on Medicaid, the agreement will show that these payments to you were legitimate, and not just an attempt to "hide" funds in order to qualify for Medicaid. Remember that this payment is viewed as income by the government, so all family caregivers must report their earnings each year as taxable income. Though the money received for providing homecare services is negligible, it will help to offset many of the costs associated with providing mom or dad with a loving, stable, and comfortable home. Find out more about why a personal care agreement can be a good idea, and how to draft one.